Our museum websites allow you add & update exhibits, events, and visitor information with ease. A museum’s website needs to pique potential visitors’ interest, and to do that, an excellent design & up-to-date information are a must. Our industry WordPress websites come with custom design work, so your website won’t be bland – it’ll match your organization’s look and feel perfectly. And the WordPress platform includes a robust CMS that allows you to update your website at any time without any coding knowledge. These custom solutions are packed with features tailored to museums and historical organizations, including exhibits, custom events, and visitor information. Exhibits: Set up and manage current exhibits or collections. Detail view includes featured image, image gallery, dates, and more. Events: Easy-to-update event calendar with categories. 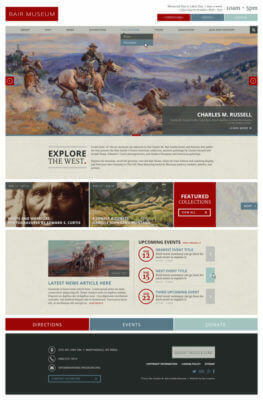 Featured Exhibits & Events: Display featured exhibits and/or events on your home page in a custom format. Editable Image Rotator: Easily update your header rotator with new images and/or text anytime. Visitor Information: Details, hours, admission and directions with an embedded map. Latest News: Display your latest blog posts in a custom format on your home page. Optional Facebook Feed: Displays your recent Facebook posts on your website in a custom format that matches your look.